With SparkFun moving forward, we take a glance at the past. Before we delve into the SparkFun of old, let's start with the good stuff - sale items! As part of the Retrosparktive, each week we are offering up a selection of classic products at "historically low prices" (sorry, couldn't help myself). We're calling this first selection the "Bare Necessities" - great things to have around your workspace or office. This selection of items is only on sale from 8/4/2014 at 12:01 a.m. MT until 8/10/14 at 11:59 p.m. MT - so get 'em while you can! BUT WAIT, THERE'S MORE! We're also offering a promo code good for $10 off any orders over $40. Just put the code "RETROSPARK" into the box at checkout to get your discount. This code is good until August 31, 2014! Via Chris Taylor, Engineering Manager: I was put in charge of Shoeshine, the internal server for the entire company. It was a windows box sitting at my feet. If it wasn't working, I would turn it off and on again. Worked every time. I was the most effective IT department in known history. When a customer called with a tech support issue, the phone rang in my and Pete's (ed: Pete Dokter, Director of Engineering) shared office. This made me Engineering, IT, and Tech Support all at once. Our first pick and place. It was old. It was slow. It got the job done. Sorta. Via Brennen Bearnes, Lead Developer: When I started, we were still building all our desktops from cheap components ordered in bulk. My first day on the job, Chris (ed: Chris Clark, Director of IT) was like, "Build a computer!" and I was like "Ok." The first computer I built didn't work. I swapped out every single component - motherboard, RAM, processor, put it in a different case - still didn't work. By like the third build that wouldn't turn on, I was thinking well, I'm probably fired. By the end of the day we had I think four different machines built." The "office" was small. 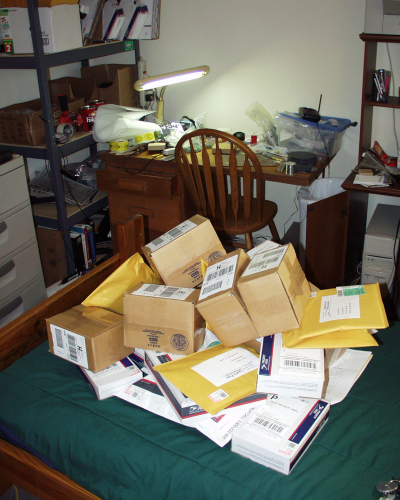 Here's a pile of orders sitting on a bed, ready to ship. Via Prashanta Aryal, Purchasing Manager (who just left us a week or so ago to pursue a grad degree): I remember my first days working in Nate's basement. It was dark and components were stored in wooden dressers and bookshelves. As you can see, things have changed pretty drastically over the last 11+ years. Thank you to all our customers who have helped us grow and stuck with us over the years - none of this would be possible without you! We'll be doing a fresh set of Retrosparktive sale items next week, so make sure to come back! I thought the same thing when I saw the hackaday post. The shopping mall food court was the Seattle Center during The Seattle Robotics Societyâs Robothon. 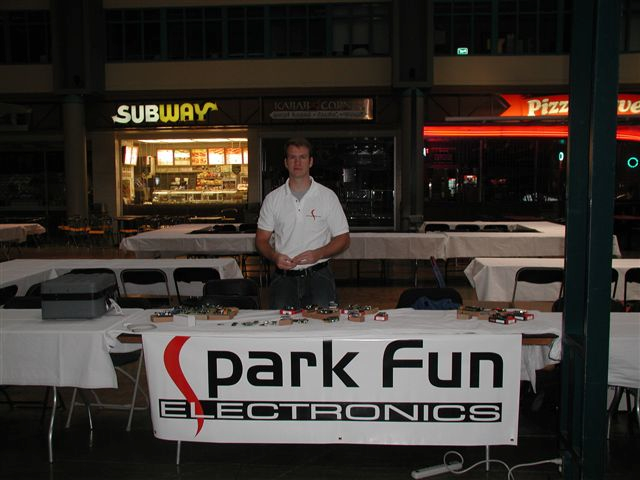 We always enjoyed Sparkfun being there. Though the one year when Nate entered a robot into the battle bot competition was very entertaining, though probably not for Nate. Its amazig to think such a small hobbiest startup can become a leading name in consumer electronics and engineering. Why not commerate the move with a time capsule? We are actually gathering stuff for the creepiest-looking time capsule ever. If anybody accidentally digs it up, they'll probably leave it alone. I saw that while I was there. It's a miniature display casket vault (the Venetian if you're wondering). If I remember correctly, Casey's family is in the mortuary business, and the mini wasn't needed anymore. It seriously looks like an infant coffin. Of course, now that I've said that, there's a good chance that they'll find this page in the archives in the future when searching for time capsule 2014 new building, or something like that. Then they can open it without fear of disturbing remains. Screw this kickstarter nonsense. Real businesses get started by selling electronics in the food court. This is inspiring! Glad to see companies like this exist and continue to be humbled by success. I woke up, saw the email about this sale and ordered at least half of the products! Thanks!! Wow the "RETROSPECTIVE" logo immediately brought back my childhood as I was a HEATHKIT builder in the 60's. Thank you picking up the banner and continuing to educate hobbyists everywhere. For you younger guys look up "Heathkit logo" to see how their early 60's logo was honored in the Sparkfun RETROSPECTIVE logo. Great memories and a spot on reference. I've been shopping with you guys since order 7600 some 8+ years ago and I'll keep shopping with you for years to come! When or will sparkfun be closed for the move? We will be. We're not entirely sure when yet. There's still some last-minute fuzz in when we're going to be able to occupy the new building. My first order that shows in the current system was 5665 for $106 on 5/23/2006. I had placed a bunch of orders before then, mostly for Olimex stuff. An order on 3/27/2007 was order 24355. 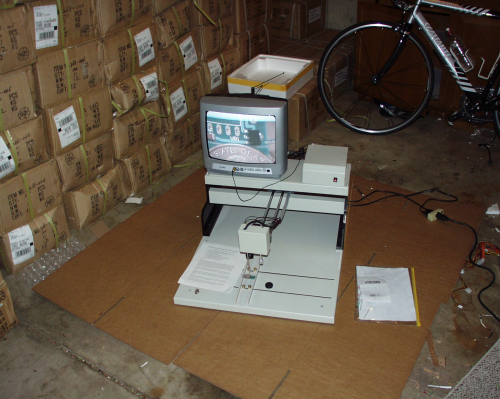 This was for PIC development boards and debug. I think you must give credit for Olimex helping start the company, it looks like a number of items on Nate's table are Olimex, and Sparkfun was the place to go for those Dev boards in the US. I'm not sure how much of theirs you now sell, you're are now making your own boards, and Arduino has mostly replaced PIC as the cheap low cost hobbiest platform. The SparkFun story is at the same time humbling and inspirational. Yesterday, Sunday, I went to the (almost complete) new building, and spent 10 minutes in admiration, peeking in and marveling what Nate has wrought. My "shipping department" is currently a small corner of a tiny shop, but seeing this story and the new building fills me (and I'm sure others too) with the sense that anything is possible. Thanks as always for sharing your story and inspiring us.